Sen. Jesse Hamilton and challenger Zellnor Myrie at the New York State Candidate Forum organized by Flatbush Tenant Coalition at P.S. 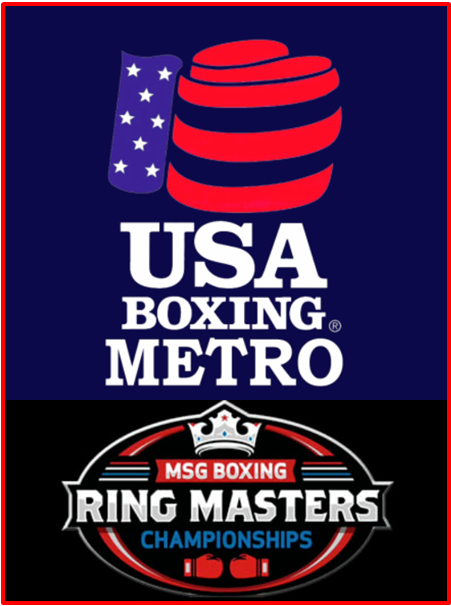 6 in Brooklyn on July 14th, 2018. 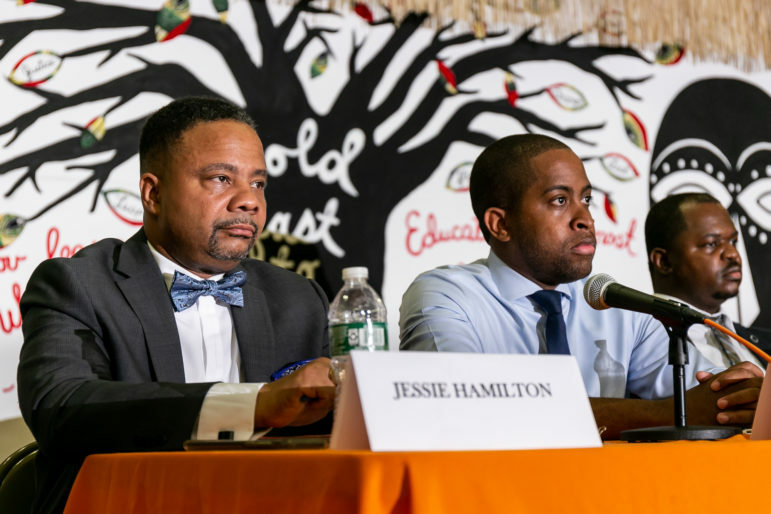 It was nearly impossible to hear Jesse Hamilton’s most important answer at the Flatbush Tenant Council forum the second Saturday in July, where he stood in his trademark bow tie on an elementary school stage. Zellnor Myrie—the lawyer challenging him in the September 13 Democratic primary—sat next to him. Hamilton had just a few minutes earlier described himself as “a lifelong Democrat.” That designation wouldn’t usually be notable in Kings County, which is home to just under a million registered Democrats. But it is important for Hamilton to mention because as a member of the Independent Democratic Conference he caucused with Republicans for the better part of his second term in Albany. The question to which Hamilton first tried shouting an answer, before stopping to wait for the forum’s moderators to hush the room, was not about the IDC, however. In fact, the IDC was never mentioned on the stage that Saturday. Instead, the question that set the room all atwitter was about whether candidates accept donations from developers. Myrie answered that he didn’t. “We are in the middle of a housing emergency in Brooklyn. What we have now is landlords and developers destroying these stories every day. And we have a state Senate that is standing right by their side,” Myrie said. Hamilton had to admit that he did. But it didn’t matter, he insisted, because he had fought for tenants anyhow. “I’ve been on the ground fighting the fight. I’m not new to this game. I’ve been fighting for the community for over two decades,” Hamilton said. Indeed, a piece of literature Hamilton’s people handed out at the event talked about the “results” he had delivered to tenants: This was a reference to three pieces of legislation—together they would end preferential rents, vacancy bonuses and vacancy decontrol—that he had co-sponsored along with about a dozen other senators. None of those bills made it out of committee. Hamilton’s membership in the now-defunct IDC and his taking money from developers present two potential liabilities as he tries to fend off Myrie, a former Council staffer. But those aren’t his only problems. Four Assemblymembers and two City Councilmembers whose districts overlap with Hamilton’s have endorsed Myrie. One of them, Assemblywoman Diana Richardson, recorded a 17-minute Facebook video lambasting Hamilton for being behind an email criticizing her for “selling out the Black community for crumbs” from a previously unheard of group called “Woke Brooklyn.” Hamilton’s name briefly was on the public registry of the Woke Brooklyn website. Hamilton later apologized, writing, “While I did not in any way see or approve the email before it was sent, that is no excuse.” But that didn’t end the vitriol. At the Saturday forum, a group calling itself Movement to Protect the People passed out a flyer denouncing Richardson and, by association, Myrie. “Now Diana Richardson wants Senator Hamilton removed and to replace him with a candidate that is being supported by the new white gentrifiers,” it read. All this takes place on a Brooklyn political landscape unsettled by the results of the June federal primaries—not so much Alexandria Ocasio-Cortez’s defeat of Congressman Joe Crowley up in Queens and the Bronx, but the narrow victory eked out by Rep. Yvette Clarke over Adam Bunkedekko in a district that overlaps considerably with the 20th Senate district, which covers parts of Brownsville, Crown Heights, East Flatbush, Gowanus, Park Slope, Prospect Heights, Prospect Lefferts Gardens, South Slope, and Sunset Park. That close call seems to have awakened the establishment to the threat of being out of a step with an emboldened electorate. 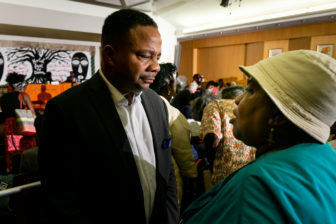 Jesse Hamilton has an advantage when it comes to campaign money and union support, but Myrie has important allies among the borough's elected officials. It’s unclear how much of the broader political mood will filter down to the race in the 20th. Allies of the former IDC members have argued that the defunct conference is nothing but an abstraction—a bit of minutiae that only insiders care about, one with little resonance among typical primary voters, who are more interested in concrete accomplishments. The problem for the ex-IDCers is that the argument against them is anything but complicated: They sided with Republicans. That’s something Democratic voters can easily understand. Fact is, the case against the one-time members of the IDC is far simpler than the case for it. IDC members justify their self-exile by citing shifting party numbers in the Senate across four elections, memories of the short-lived “gang of four” coup in 2009, and a modest resume of policy achievements: a higher minimum wage (though not for tipped workers), a paid family leave program, the SAFE Act, raising the age of criminal responsibility in many cases, funding help for legal immigrants and getting universal pre-Kindergarten passed. IDC critics counter the Senate would have accomplished that and much more if Klein and the breakaway faction had stuck with the Democrats after the 2012 elections, when Democrats gained control of the upper house. Other progressive goals, like fully funding city schools, codifying more comprehensive abortion rights, passing the DREAM Act and improving rent stabilization, languished during the IDC’s alliance with Republicans. If the former IDC members survive the primary challenges they face in September—most of them probably will—it will be thanks to incumbency and their personal brand. It will be in spite of, not because of, their years gone astray from the Democratic mainstream. This dynamic puts Hamilton and Marisol Alcantara, who were first elected in 2014 and 2016, respectively, in the most danger, since they are the two former IDC members with the shortest Albany records. Hamilton has authored 10 bills that have been signed into law. Most deal with financial regulation, reflecting Hamilton’s chairmanship of the Senate’s banking committee. One law reduced the frequency of bank examinations for lending institutions with between $250 million and $1 billion in assets. Another calls for the Department of Financial Services to make recommendations on how to regulate pension loan advancements. Hamilton does have significant union support and a modest financial advantage, with $212,475 on hand to Myrie’s $155,588 according to July filings with the state Board of Elections. Hamilton has received big chunks of change from the Real Estate Board of New York (REBNY), a couple pro-charter-school entities and the check-cashing industry. But he owes his financial advantage to disbursements from the IDC’s own campaign account, which has transferred $129,000 to Hamilton. A judge ruled last month that that account had violated campaign finance laws, and the state’s chief election regulator has questioned whether its donations to former IDC members are kosher. Myrie’s biggest donor is Lushawn Thompson, widow of the late Brooklyn district attorney Ken Thompson, who wrote him a $7,000 check. He’s also received $6,000 from the No IDC Pac . Some of the first press Myrie got was negative: Back in October 2017, shortly after he announced his intention to run, Kings County Politics raised questions about Myrie’s work from 2010 to 2012 as an aide to Councilmember Fernando Cabrera, whose conservative positions on gay and reproductive rights are well known. Myrie has said Cabrera’s views did not mirror his own. Myrie campaign website has a tab slugged “No IDC” where a video narrated by Edie Falco helps state the case against its former members. But he says it’s a topic he raises carefully. “I don’t lead with the IDC. I talk first about the issues because that’s what’s most pressing and what resonates most with folks,” he says. If you delve into the weeds of how many senators each side had after each election and where Simcha Felder threw in his lot, Myrie says, some voters are not interested. But if you say a Democrat went to Albany and sided with Republicans, “that is something that is very clear to folks and they can understand, and they are upset about and feel betrayed about,” he adds. Myrie says his past work for a socially conservative City Councilmember does not reflect his personal views. A native of Prospect Lefferts Gardens, Myrie said the driving anxiety in the district these days is the threat of being pushed out. 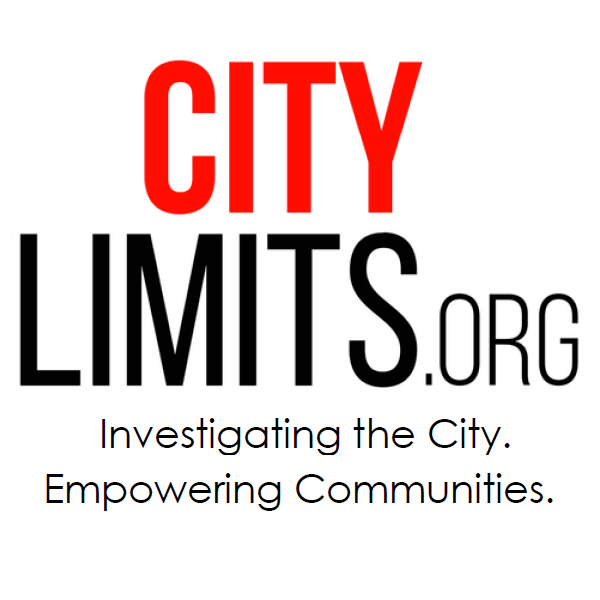 “The biggest civil rights and racial issue in the district is housing.” He wants to return de-regulated apartments to the rent-stabilization system, end preferential rent and vacancy decontrol, and limit the length of time so-called “major capital improvements” can increase a tenant’s rent. He believes the state can help close NYCHA’s capital gap by reducing the amount of the stock buy-back tax that New York currently automatically refunds, about $14 billion a year. He also supports ending cash bail and making undocumented immigrants eligible for driver’s licenses. 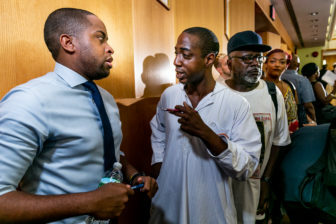 While his campaign biography describes him as a lawyer and a spokesman says Myrie did practice law at a firm for nearly two years after graduating from law school in 2016, he is not yet a registered attorney with New York State. Myrie’s campaign says he has passed the bar and ethics exams necessary to complete that registration, but held off finalizing it to avoid any conflicts during the campaign. Also in attendance on that same stage were District Leader Josue Pierre and NY State Assembly candidate Anthony Beckford who is running to push out the pro gentrification, unaccountable incumbent, Rodneyse Bichotte. What kind of blow crap is this?!!! How can you put in the first paragraph this line: Zellnor Myrie—the attorney challenging him in the September 13 Democratic primary—sat next to him. Then in the last paragraph: While his campaign biography describes him as a lawyer and a spokesman says Myrie did practice law at a firm for nearly two years after graduating from law school in 2016, he is not yet a registered attorney with New York State. Basically strategically trying to give Zellnor caliber as if he’s on the same level as Senator Hamilton who IS a legal attorney. For a person (Mr.Zellor) whom I never saw at ANY Community Board meeting, Precinct Council meeting, Community Education Council meeting, gun rally, mental awareness event. DOT/Sanitation/NYCHA/senior center or anywhere in the 20th Senate district before this campaign season. Not married nor have children in the 20th Senate District. Office skills at an elected official’s office to validate real office experience, questionable if any. I think both should lay out how they’ve helped the community, and show real numbers of constituents cases resolved, by each of their offices. Oh my bad, one opponent doesn’t even have that, neither. An option or political tip would be for the unfortunate on to maybe start on an intern level in an elected official office. And to think, this is what the 20th Senate district community have time to consider or gambling on, in bringing continuous resources and services to the community. SMH. What the heck are you blathering about? The facts are simple. Hamilton is a traitor. Hamilton caucused with the Republicans as part of the IDC group of slimy traitors. Hamilton has to go! I don’t care if Zellnor Myrie is a broken Krusty the Clown toy, as long as he can be loyal to Democrats. To be clear, I wouldn’t require that loyalty of a senator from North Dakota or West Virginia because those are red states — but this is DEEP BLUE BROOKLYN (not even Bay Ridge or Flatlands, either) and Hamilton didn’t do it for ideological reasons anyway, he did it for the legalized bribes — nicer offices, etc., provided by Republicans! OUT HE GOES! OUT OUT OUT OUT OUT! Little separates the two candidates except that fact that one pledged not to join the Independent Democratic Conference and the other did. So, how important is that fact? She’s worked for the stalwarts of the Democratic establishment for two decades, but says she is in step with the party’s new embrace of change.